I have a confession to make, I don’t have a Mac. I would like a Mac. I would really like one very much – but for now…I don’t have one. When I ordered this laptop, they said – “Dude, you’re gettin’ a Dell.” I’ve been happy with it so far – but when the time is right…I want a Mac. Why should you care? Because in today’s video, Ed talks about setting the preferences in Flock….and shows you how to do it on a Mac. But, I don’t have a Mac – so, I’ll do my best to show it being done on a PC. The differences are minimal anyway. First, we’re assuming you’ve already installed Flock. Second – as a reminder, you should go through their tutorials to learn more about Flock and how to get the most out of it. 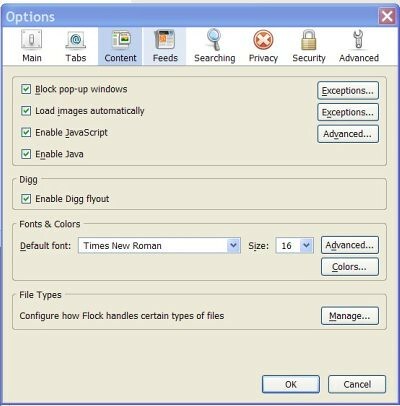 For current FireFox users – you may notice, some of your FireFox extensions come through. But this session is mostly about how to set up your Flock options or preferences. On a Mac, you would go to your >Flock>Preferences Menu. On a PC, you would go to your >Tools>Options Menu. 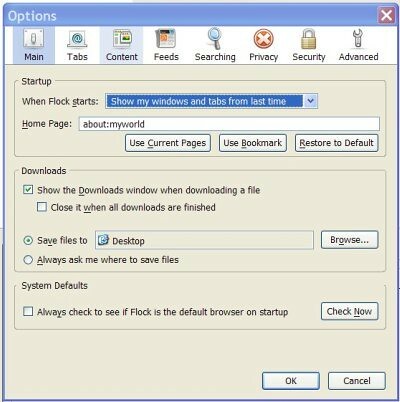 3) Tell Flock how you would like it to handle downloads – check the “Show the Download…” box – tell Flock the default location you would like to save files to. 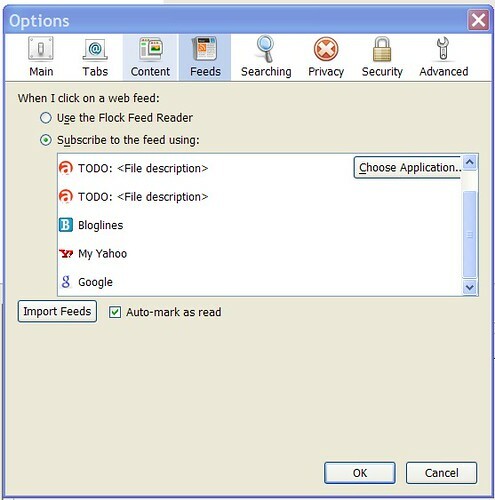 4) Make Flock your default browser. As Ed says, “Tabs are fantastic!” He’s right – new pages should be opened in a new tab. I agree with Ed – it’s easier to manage several websites from tabs, than to try and scroll through multiple windows. Again, the settings shown above reflect Ed’s recommendations from the video. 3) Leave the “Always show…” box unchecked. I think all of these were left at the default settings, at least for me – but here are the steps. Ed does mention that most of this right now is “technical set-up” stuff – we’ll be learning more about how to use it and why some things are done certain ways as we get into the challenge. Simple enough – it will become apparent later on how much time you just saved yourself. 2) For the “Live Results” – which is kind of a supplemental search – Ed recommends selecting the “Favorites and Recently Visited” and “Technorati” option. He does make mention of using some of the other options – particularly for US users maybe trying to find items or products. 3) For the “Include In Search Elsewhere” – Ed had Ask, Google, Amazon, Wikipedia and eBay checked off – that’s all I could see from the video – feel free to play with these. From there, Ed takes us to his Underachiever Life Blog – and shows us how to subscribe to his RSS feed and get that feed into Google Reader. One more example – we zip over to the Thirty Day Challenge Blog – and get subscribed for that RSS feed as well.